I started dreaming of being a veterinarian at the age of 7. I grew up in Jacksonville, Florida among the beaches and the seagulls, but one horseback riding lesson later, I was hooked. Horses were my passion growing up, but I loved all animals. I am guilty of bringing home the stray cat now and then and promising my parents “it followed me home.” When my family moved to central Ohio, I was able to realize my dream of having a horse (two in fact! ), and I competed in 4-H all through high school and in IHSA in college. I even focused my Girl Scout Gold Award project on helmet safety. I have always had animals around the house—dogs, cats, chickens, horses, a goat named Edger – and I have loved every minute of it. I went to a small college in northwest Georgia named Berry College for undergraduate and earned my BS in Animal Science. I returned to Ohio for veterinary school, earning my veterinary degree at The Ohio State University. 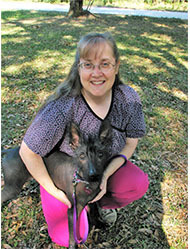 Wanting to get away from the cold winters, I returned to Florida and began my career as a mixed animal practitioner, working with many different species. I even had the opportunity to work with elephants, camels, and alpacas that were part of a traveling circus! I found that my favorite aspects of veterinary medicine though are being witness to the strong human-animal bond and helping to keep people and their animals together. After meeting my husband, George, and living in Florida for a couple years, we knew we wanted more from our environment. We decided on Portland because I have some family here, and we love that we can get to all of our favorite outdoor places for day trips. George and I have 4 dogs, 3 cats, 2 horses, and a fish! They keep us busy—hiking, riding, and playing at the coast. I do like to dabble in tennis and when it’s rainy, we love to visit the wineries and breweries and taste what Oregon has to offer! I cannot wait to meet all of you and your wonderful pets and share my love of animals with all of you! I love animals and I love people. While in college, I took a position with a local veterinary hospital and that is where my passion took off. 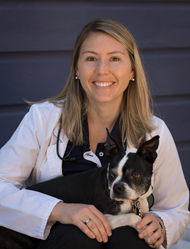 I started entry level, and after my college graduation I stayed on board with the same veterinary practice and worked my way through the ranks and spent ten years as their hospital coordinator. The job title was very much like a practice manager, but so much more. I organized communication and hospital flow, and was the main go between between doctors, clients, fellow staff, outside vendors, reps, and local rescues and other community outreach programs. It was a wonderful career, so professionally and personally rewarding; I loved it so! Over the next few years I also became a positive reinforcement dog trainer, and eventually a dog training mentor for new dog training students. Most recently my husband and I also started taking in unwanted reptiles/alternative pets as it is easy to find a rescue for dogs and cats, but the alternative pets are often overlooked in the rescue world. We are now a safe haven and forever home for three bearded dragons, a leopard gecko, and a previously seven legged tarantula. We also have four dogs, so our home is very lively with animals. I was so happy When Dr. Dawson asked me to join her team. Blue Door Veterinary shares the same love for animals and their people as I do. I look forward to speaking and/or emailing with you soon!